Buy Hope's Relief goats milk soap bar 125grams in the UK from our online shop or directly from our independent Scottish store. If you want to automatically receive an email when 'Goats Milk Soap' is back in stock, just leave your email address below. Soothing and gentle for babies and adults. Ideal for skin prone to eczema, psoriasis and dermatitis. Hope’s Relief Goats Milk Soap is ideal for babies to mature adults and lets you wash and clean with no irritation and no itching. It is pH balanced, full of nutrients and proteins that moisturise skin cells. We use only 100% pure Goats milk not powder and your skin and your babies skin will feel unbelievably soft and smooth with no irritation. We sell real Hope's Relief and other Problem Skin directly from our shop in Scotland and online throughout the UK. View more products from Hope's Relief. Where can you buy real Goats Milk Soap safely online? 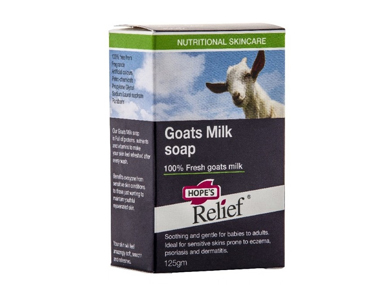 If you are wondering where you can buy Hope's Relief goats milk soap bar 125grams safely online in the UK, then shop with us. Goats Milk Soap - Hope's Relief goats milk soap bar 125grams in Problem Skin and Medicinal Skin Care.